New Year's Eve 2009, I was in a small Ecuadorian town while doing a stint of volunteering. It was a purely local affair, being in the country, apart from the six foreign girls. The locals there have a tradition of making these life size dolls, stuffing them with old clothes. Normally one doll is made per household. The dolls represent the old year and are ceremoniously burnt, stacked in a pile at midnight. 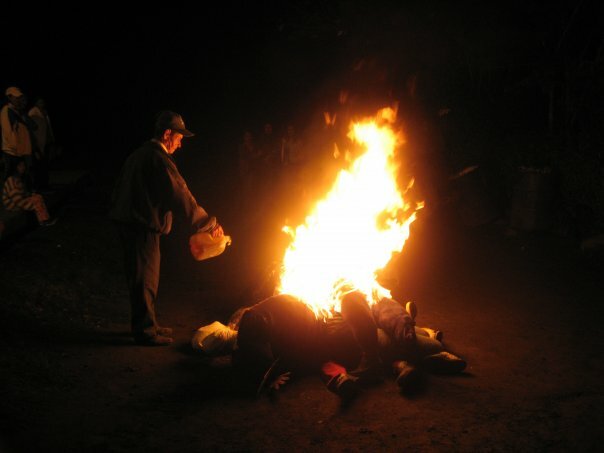 Don José, the owner of the local store, pours more petrol over the pile of burning dolls.